From time to time, I love sharing neat inventions I find. I explained here that inventions always bring fond memories of my Dad's creative mind. 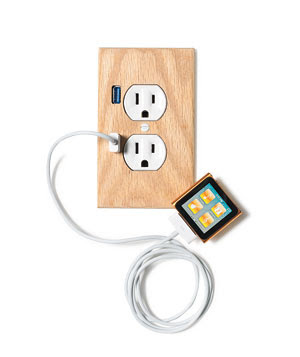 Here's a clever one for charging your phone or iPod. The U-Socket is an upgraded outlet that fits a standard socket - is easy to install - and has two USB ports. You can charge your phone without unplugging a necessary lamp or clock! I love creative people. It is $25 and available at www.fastmac.com.